i miss the ghostbusters tv show. lol i dont know if i miss it THAT much. i dont really want to buy it, what i think i would rather have is another youthful saturday morning, where waking up and watching cartoons was exciting. any episode where they had to go INTO the thing where they stored the ghosts was an awesome episode. What the hell was the deal with the dueling Ghostbusters cartoon shows? I only vaguely recall them from my childhood, but didn't one of them feature Slimer and characters that roughly looked like their movie counterparts and another show that used the same character names but they looked totally different? How the hell did the something as simple as licensing a kids show become such a trainwreck? As far as Nancy Reagan and her wonderful war on drugs.... The only thing it did for me as a child was to give me the realization that if all these adults wanted me to stay away from pot, then I need to find some of this stuff. My memories from the following five or six years are pretty hazy... but when I came out of it, I owned a lot of hemp clothing and water bongs and was in my sophomore year in college. The only thing it did for me as a child was to give me the realization that if all these adults wanted me to stay away from pot, then I need to find some of this stuff. My memories from the following five or six years are pretty hazy... but when I came out of it, I owned a lot of hemp clothing and water bongs and was in my sophomore year in college. the worst was the slimer show which was annoying and stupid. There was a Ghostbusters cartoon that existed in some form before the movie came out that featured two guys and an ape. The movie spinoff was therefore called The Real Ghostbusters. I downloaded the Cartoon All-Stars special a year ago because I was so pleased to actually see it floating around on the internet, but I didn't even finish watching it. It's better remembered than revisited. In the beginning, there was "The Ghost Busters." 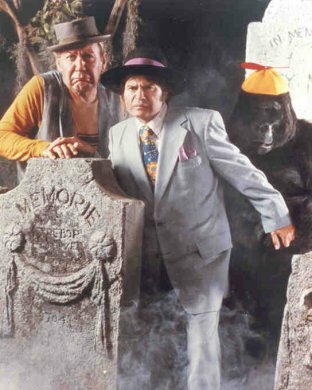 I've never seen it, but it's coming to DVD and it was a live action kids show in which a gorilla and 2 men hunted ghosts. As near as I can tell, nobody watched it or remembered it. In 1980, Filmation made it into a cartoon, simply calling it Ghostbusters. Nobody watched it or remembered it. It was oddly similar to the Ghostbusters movie, but had no real connection. In '84, a little movie called Ghostbusters came out, having nothing to do with either of these other two shows. Many, many people watched and remembered it, and they decided to make it into a cartoon. About that same time, Funimation saw a good opportunity to show THEIR Ghostbusters cartoon and ride the coattails of the movie's success. Here's the thing. You can't have 2 cartoons named Ghostbusters. This forced the adaptation of the movie to be called "The Real Ghostbusters." Is that Joe Pesci in the middle? Also, thanks Pak for clearing that up. I remember watching the Filmation Ghostbusters cartoon on Nickelodean back in the day. This was in the Double Dare/You Can't Do That On Television era of Nick. Man. Remember when they made shows for pre-teens that weren't just G-Rated clones of Beverly Hills: 90210? Now it's all Lizzie Maguire or that show with Britney Spears' little sister, or that other show with the girl who looks like Britney Spears' little sister that they apparently made for the sole purpose of confusing adults into thinking that it's the show with Britney Spears' little sister, and it works because the two shows, from what I can tell, are virtually indistinguishable from each other. In fact, you could probably take footage from an episode of one show, and splice it together with footage from an episode of the other show and have me sit down and watch it, and I'd have no way of knowing that you had done it, and it would probably not have any affect on my ability to follow the plot of the show. Larry Storch, from F-Troop, actually. I actually watched this show when it was on. 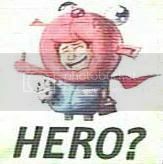 (It was mid-70s, when the networks were on a live action kick on Saturday mornings. Far Out Space Nuts, Shazam and Isis, the Bannana Splits and the Sid and Marty Kroft stuff are from about the same time frame, IIRC.) Unfortunately, the only things that I recall from the show are the gorilla, the jalopy and a crystal ball with a guy's head in it. (Who I recall looked a bit like Jombi, but that just might be my memory playing tricks on me.) It wasn't very memorable to me for anything other than the F-Troop guys being in it and the name.